What if everything you believed turned out to be a lie? For Alix Banks, that’s the problem she faces when the mysterious 2.0 takes a close interest in her life, and makes her question every aspect of it. It’s one of those rites of passage that everyone goes through at some point in their life – realising that their parent(s) aren’t perfect. 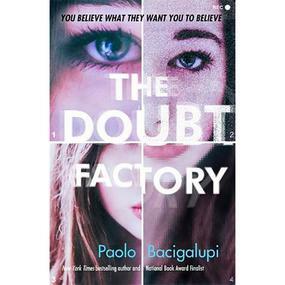 For some, the hand life deals them means it comes horrendously early; for others, it’s part of their teenage experiences, and it’s those people at whom Bacigalupi’s novel seems squarely aimed. Alix has what seems to be a perfect life, not really understanding what it is her father does until it’s brought home to her in a brutal way that his “PR job” actually is enabling people to get away with murder. That may sound melodramatic, but if someone takes active steps to prevent people from knowing that a course of action will lead to their death, what other word would you use? There are a few places in the book where the author (through his characters) becomes a bit preachy on the subject, or at least that’s how it may come across to an adult audience – but have you ever tried arguing with a teenager about something close to their heart? Bacigalupi incorporates that passion into the text, and like Alix, you may find yourself querying some of the stock phrases that you hear banded around when “science” is being used as a gag. Some years back, I wrote a book on conspiracy theories entitled That’s What They Want You to Think – and that could easily be the subtitle for this too!